Sport: Just a few on the shore today all on half day tickets and one boat out but everyone had action either landing one or two or losing one or two. Antoon Gysbers fished for a couple of hours this morning and caught two nice rainbows to 3lbs 4oz. He caught at Barn Quarry and near the jetty on a floating line with a snatcher and a cat. Simon Dove also had two on diawl bachs fished under the bung. Simon fished along the shore at two trees. This entry was posted in Stocks Reservoir Fishing Reports on October 23, 2015 by staff. Sport: The best catch today was taken by bank angler John Wilkinson with his 4 fish. John fished around the jetty and 2 trees area where he found an apps bloodworm on a floating line his best tactic. From the boats the best area was up in the northern shallows near the saddle. Boat anglers be careful in this area, it is not advisable to motor across the saddle as the water is now very shallow over this area. Syotw. Paul. This entry was posted in Stocks Reservoir Fishing Reports on October 15, 2015 by staff. The Northern Shallows had a day of peace and tranquillity today. There were no boat anglers, which is a shame because conditions looked great and the weather was kind. On the bank a handful of anglers caught an average of 1.5 fish each, all from Two Trees to Bell Point. There was a 50/50 split between the minkies and black tadpoles. Well done Phil Meakin and Dan Pletan, both landing 3 good fish each and both on half day sessions. Dan’s bag was 7lbs 8oz for his three rainbows. This entry was posted in Stocks Reservoir Fishing Reports on October 14, 2015 by staff. Great conditions on Stocks today and good sport was enjoyed. In particular the Northern Shallows fished very well on dries today, accounting for over 60% of total fish from the boats. Both Tom Speak and Dermot Speight (4 fish on dries) commented that they missed more than double the number in the net. The remaining 40% (ish) of todays fish were caught exclusively on minkies as the trout continue to chase the abundant fry. Two Trees and Hartleys fished very well from the bank accounting for all of todays bank caught fish. This entry was posted in Stocks Reservoir Fishing Reports on October 11, 2015 by staff. As autumn days go today was a very pleasant one and a joy to be outside in. The sport wasn’t too bad either. 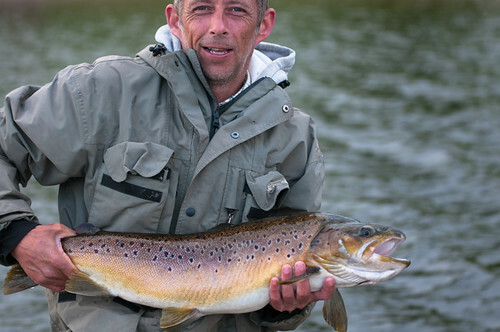 Notably; Bob Fitzpatrick had six trout the boat, washing lining nymphs in the Northern Shallows. In the same area Ron Melling had three to the boat in his half day session, however Ron fished a claret midas on the surface to catch his. Digger and Bernard found drifting along Hartleys to be their best area to catch their 10, losing as many in the process. On the bank Hartleys and Bens Beach were popular and also productive, for most at least. Pulling and or twitching boobies with a variety of sinking lines is the method of the day. Nigel Simpson took a respectable 4 fish bag, commenting that he had a pull every cast after 4pm. The Stocks and Shares competition that was scheduled for tomorrow will now be postponed for a couple of weeks due to there being too few entries. Admittedly we announced the comp’ a little too late and will give more notice once a date is set. This entry was posted in Stocks Reservoir Fishing Reports on October 10, 2015 by staff.